Among the Maiar are counted Arien and all her sisters. They came to Eä like a rain of flames from the heavens, being spirits of fire. They became servants to Vana the Ever-young. They would walk with her and sing with her, they would obey her orders and help her in her work - all but the very least one, who is called Tinwen. For Tinwen had little power and few skills, save the art of playing and joking. She would run around and hide herself, she would take funny shapes to surprise her sisters, she would forget any work assigned to her and ask questions that had no answers. Nonetheless all loved Tinwen and sometimes Vana herself, feeling even younger than usual, would play with her. When their mingled laughter rang in the air of young Arda, those that heard it thought at first it was the echo of the voices of the Children of Ilúvatar. In the beginning of days, when the Ainur dwelt upon the Isle of Almaren, Tinwen used to spend a lot of her time wandering around and watching the work of others. Her special interest turned towards Aulë and his servants, for their craft in those days was massive and awe-inspiring and they worked with the fires of the earth that were dear to her. One day she was observing Cúrunir the Maia at the task of shaping a mountain. Cúrunir, however, did not like being observed, since his work wasn't forming like he would have wanted - the colours of the stone wouldn't mix right, and the harder he tried, the worse the result. In his frustration Cúrunir shouted at Tinwen, declaring there was no use in the world for the likes of her. Suddenly another voice replied: "If there be no use for Tinwen Híniel the Child-minded, then what use is there for the stars in the sky and the sound of the wind in treetops, for the clearness of spring-water and the roundness of seashore stones?" And after this spoke yet another voice, saying: "Indeed she is a star in the sky, covered with many veils but bright behind them, Cal-Urúnya the blazing red flame." The first voice belonged to none less than Eönwë the herald of Manwë who had heard the shouting from afar, and the other speaker was Turon, a servant of Aulë who had been working nearby. Thus Tinwen got two new names from two new friends. But between Cúrunir and Turon no friendship would ever be. Now Eönwë was close to Manwë and had also wisdom of his own. He felt in his heart that the Spring of Arda would not last forever, so he prepared himself for war against Melkor. He became worried for little Híniel wandering often all alone in the wilderness. So he begged Aulë to make a powerful sword, but one small in size - for the raiment and shape of Tinwen was like that of a Child of Ilúvatar in the early youth, she was small and slim, with furry bright red hair (thence 'Urúnya') and star-blue eyes, and she usually clad herself in a loose green jacket and red breeches tied with a wide golden belt and walked barefoot. Aulë made the sword, which was sized like a knife and would get warm and glow red if enemies were near. Eönwë took it to Tinwen and instructed her in its use. She understood little about warcraft, but rejoiced at the beautiful artefact and named it Elmacil. Eönwë saw Tinwen's eyes blazing with joy that moment and the sight was burned into his heart forever, and when he left he carried those eyes with him to Manwë's residence. Meanwhile, Turon also thought a lot about pretty little Cal-Urúnya, and her laughter rang in his ears as the sweetest music ever heard, and he would find himself laying his work aside and going to search he knew not what until he found Tinwen. And she would chatter with him and listen to him. Turon decided to make her something to play with. He sought far and found a stone that was black as night but yet seemed to hold brightess on the inside. He cut it in half and shaped it's halves like two mirrors and polished them bright. The one he kept, the other he took to Tinwen. He found Tinwen just as Eönwë was going away from her, and saw her watching his departure with longing. Turon went to her hiding his jealousy as she showed him the sword Elmacil. "A fine thing this is to have", said he, "and I see it be made by none other than Aulë my master. Now, I also have brought you a gift, but I fear it will seem little more than a trinket to one receiving Aulë's handicraft. For I made my gift myself, and put all my love and all my skill into it, but I know my power to be lesser than Aulë's." These word put a sadness in Tinwen's heart that she understood not, and she declared: "Aulë may be greater than you, but he cares not much for me and did not come himself to bring me the sword. You, on the other hand, have come and I am honored by the amount of work you have done just for my sake. I will be more than pleased to receive a gift of yours." So Turon gave him the first of the Morglini, the Black Eyes he had made. It was a round slice of stone that seemed dark at first glance, but at a closer look revealed all the colours of the rainbow, and changed hue when turned into an another position. Tinwen was glad and spent a long time watching the colours in the stone. Then she put it into one of her pockets (her jacket had an impressive number of them) and thanked Turon with a smile that was piercing in sincerity. Turon could not forget the sight even if he had wanted to. Little Tinwen was now wearing a sword on her belt and carrying a jewel in her pocket. She had two dear friends and Vana still loved her. She knew she should have been very happy, but she also knew she was not. The forebodings of Eönwë had given her fears and nightmares, and the jealousy of Turon was cutting her in half like the stone that was cut in half. One time when she slept Turon woke her up and asked her to come with him. "Not for long. The Valar wish to possess us and enslave us. Your 'helper' Eönwë is involved in the plot. He has been promised he will have you as his prize. He is going to imprison you and eat your heart from your living breast and pluck your pretty eyes out and wear them as decorations." "I don't believe that. Eönwë is not cruel. Vana loves me and would never have me harmed. And my sister Arien is very wise and loves the Valar. As do I." "Are you calling me a liar ?" "No. I'm saying that whoever 'warned' you has either lied to you or been lied to. Please don't go. Let us go to the Valar and ask about this." "You must come. We have to leave before it is too late." "Come back soon, Turon! Farewell!" But Turon would not come back, and Tinwen would not be comforted in her sorrow. None of the games her sisters wanted to play would please her, and she would often go to some hiding place and weep there. Eönwë found her on one such moment. "Tinwen, come out! I love you, is that not enough? If Turon does not return, then he cares little for you. You should start living again. Please, Híniel! Manwë has ordained a great feast on the Isle of Almaren. Would you not come and dance with me?" "I will," replied Tinwen, and went with him. In her heart she held the hope that Turon would hear of the feast, understand his mistake and return. The feast was great indeed and merry, and joy came back to Tinwen's eyes, and she laughed with her sisters and smiled at Vana. Clad in glorious green raiment Tinwen danced for Eönwë, and for Eönwë alone. Then it came to pass that Tulkas espoused Nessa, and on that moment Eönwë held Tinwen very close to him and she knew what he wished. Tinwen was weary of dancing and slept content on Eönwë's arms, until she was wakened by a sudden feeling of worry. She felt something strange in her pocket and took out the Morglin-stone and lo! It was ice-cold and covered with frost. "Oh, Turon, my friend! How could I forget you in the celebration? What has happened to you? Are you in peril? I must come to you at once," Timwen thought. She was overcome with panic and without halting any longer she started running northward from Almaren. She startled, regognizing the voice at once. It was the same voice that had first given her the name, but now it had changed into a mere deep, joyless echo. "I have a new name now. Call me Thauron." With these words the shadow revealed a face, the face of Turon, but illuminated by a sickly light. All love and caring had departed from the eyes. He was handsome, terrible and full of malevolent power; Sauron the Great, servant of Melkor. Terror filled Tinwen, but she stood her ground unfaltering and drew out Elmacil, which was glowing red as blood. Dangerous was Tinwen Swordbearer on that hour, with Aulë's craft in her hand, her hair a blazing storm of fire and her eyes anger-filled. "I see my friend Turon is dead, killed by Thauron, servant of the Enemy. Begone, ere I cut you in half like you cut my heart in half!" Thauron departed, shouting: "I do not wish to harm you, for the sake of the memories we share. I wish you could follow me freely someday." Tinwen was still angry and still lost alone in the woods. In her despair she called out for Eönwë. And Eönwë came indeed very quickly, for after waking up without Tinwen he had hurried out in pursuit of her. He ran to her and embraced her, relieved. Tinwen told about Turon's betrayal. Together they took the news to the Valar. Aulë, hearing of the treason of his servant, cursed Thauron and all his works. On that moment the Morglin-stone in Tinwen's pocket lost all its colours and became as dark as the Void. Then came the time of war and Melkor broke the lamps of Illuin and Ormal and the spring of Arda came to its end. The Valar departed to dwell in Aman and Tinwen went with them, hand in hand with Eönwë. Long they dwelt contented like brother and sister under the light of the Trees, playing together and making pretty things to rejoice at. Eönwë served Manwë and abode on Taniquetil, while Tinwen built herself a funny little house on and under the western side of a hill. It was the appointed moment for the Elder Children of Ilúvatar to awaken at Cuiviénen. And the Valar held Council and decided to make war on Melkor. There went also Eönwë the herald bearing the banner of Manwë, and followed closely by a little hopping flame; Tinwen playing with her sword. The victory of the west was swift; they drove Melkor into Utumno and besieged it. Finally the gates were broken and Tulkas wrestled Melkor and he was taken captive. But Sauron they did not find, and Tinwen was troubled. The victorious army returned to Aman and Melkor was doomed by Mandos. Thus began the Summer of Arda. And it came to pass that the Eldar finally arrived to Aman. Such joy there was in the land those days, when the Vanyar, the Noldor and the Teleri beheld the light of Laurelin and Telperion. And none was more pleased at the sight of the Children of Ilúvatar than Tinwen Híniel, who clothed herself in the shape of an elf-child and played with the children of the newcomers. She taught them all her games and songs, and there were many of these. Thus the ages went by, and Eönwë still waited. Then one was born to shine like a golden star: Alatáriel, daughter of Finarfin. This little one became dearer than all the rest to Tinwen. Hand in hand they walked under the trees of Kementári, side by side they sat under the stars of Elentári, heart to heart they understood each other, soul to soul they belonged together. When they slept in Lorien they shared their dreams, and often they dreamed of a great light rising in the East, red and golden. When Alatáriel grew to be a maiden, Tinwen changed her raiment also. She turned her hair golden like her friend's, and none save Alatáriel's mother Eärwen and Eönwë could regognize which maiden was of the Noldor and which of the Maiar. Eönwë thought his long wait was over, and asked Híniel to marry him. But Tinwen said she would like to see her friend Alatáriel married first. However, they were engaged and Eönwë gave Tinwen a diamond ring. The Summer of Arda was long, but eventually the fruits of talent were almost gathered, the flowers of youth were full-bloomed, the birds of joy were preparing to fly away and the skies of hope were turning grey. Feänor had made the Silmarils. Melkor was unchained. Tinwen hated the Dark Lord who had taken Turon away. Every time she saw Melkor, the sad memories within her stirred. More and more she yearned for the Spring to return. She was alone more often, though she tried to tell Alatáriel about her worries. Tinwen started to think that Melkor had indeed changed, and then she wondered if Thauron might change too � if she could change him. She went to talk with Melkor. She did not know then, but it was Melkor's idea and not hers that she should seek Thauron in Middle-earth, under Angamando (the fortress known in lore by the Sindarin name of Angband). Manwë sat on his throne with Varda by his side, when Eönwë brought Tinwen up the Taniquetil. "High Lord, said the little Maia, I have come to ask permission to depart from Aman." "You may go," said Manwë, "fare well." But the eyes of Varda held worry. On the way back Eönwë had many questions to ask. The only answer he got was a farewell kiss and a diamond ring. Alatáriel was grieved. Over and over again she had asked her friend to stay. Tinwen tried to comfort her. "Sweet one, I know we will meet again. I shall not bid you farewell. Nor shall I give or take any gift of departure, for I trust we two will remember each other without things made by craft of hands. Now give me a new name and I will give you one." "Beloved, you are Maialaurë El-Carnil" (a golden Maia, of the red star Carnil). "My sister, you are Eldatári Lauremiriel" (a queen of the Eldar, a golden jewel). Then they laughed. And embraced. And departed. And cried. Deep were the caverns delved by dark creatures under Angamando, deep and dangerous. They offered a place of hiding for the servants of Melkor biding for their time. There slept the valaraukar, spirits of black fire. There dwelt hordes of orcs and trolls, and other creatures, ones never seen above ground, nameless ones. It was a world of chaos and anarchy, countless fights, hunger and cannibalism, hunting and being hunted, blood and fire. There were labyrinths of interweawing tunnels, underground streams and lakes - some of these held water and some held molten stone. It was hot down there, and sometimes the earth itself shook and new crevices opened full of flames. In the midst of the tunnels there was a high, lightless chamber with a throne-like chair by one wall. On the chair sat an unmoving figure clad in black. There was nothing else in the room. Suddenly there was light in the room. Sauron shrieked and covered his eyes from a blazing golden flame in the air. He heard laughter sounding like fresh wood burning. Laughter of joy without malice. Slowly he opened his eyes to the light. In front of him there was, not a fire, but a woman with golden hair. He thought he regognized her from the past, but he did not remember who she might have been. His dearest memories were hazy, covered in the black slime of Melkor's power. Then she noticed her smile when, wordlessly, she took from her pocket a black stone. "Please!" Sauron fell to his knees. "Anything. Just do not go away. Destroy me if you came for that. I let you." "Then would you come with me to the Mahanaxar. For your judgement." "For my captivity, you mean?" Sauron stood up. She told him about Melkor's captivity and his freedom. Sauron asked many questions about the repentance of Melkor, and Tinwen answered him with confidence. Then Sauron told her he had suffered under the rule of Melkor and wished to be free, but he would not dare go to Aman because he did not want to see Melkor ever again, changed or not. Tinwen thought she understood him; she, too, had felt uncomfortable near Melkor. "Because of him I lost you," they told each other. "How could I do this?" "To begin with, call me Turon." And Turon he looked like now, turning his clothes bright gold and blue, surrounding himself with pale golden light, tall and handsome and smiling. And loving. "Oh, Turon, my love! Have you truly come back to me?" Turon appeared to shudder with emotion; he fell to his knees again: "Would you truly take me back, Tinwen?" A shadow fell over Tinwen's face. She had forgotten all about Eönwë. They had been together for ages, three ages to be precise, in Aman. Would she abandon all that in one moment under the ruins of Angamando with one who had served Melkor all those ages? Well, she had already, when she had given the ring back without explanations. "I left him in Aman and I will not go back." "Will you promise this to me?" Turon got up from the floor. "Will you swear this by the Morglin-Stone?" "By this Morglin-Stone that I hold in my hand, I, Tinwen Cal-Urunya, swear that I will not return to Aman for the sake of Eönwë the banner-bearer of Manwë. May my lady Vána witness this, and Melkor also." Tinwen was not sure why she called Melkor to be the second witness, but she felt she must do this in order to make the oath more binding. However, she left herself the possibility to return West for the sake of Alatáriel. No place on Arda is completely without beauty, for such is the power of Eru Ilúvatar. Thus, even under Angamando, there were hidden caverns full of colourful stalactites and stalagmites, gleaming crystal and clear waters. There were pillars of stone that reached up like trees in a forest, and veins of mineral that bloomed like flowers. The echoes of streaming water and the sounds of drops falling from stalactite to stalagmite sounded in places like birdsong, rustling leaves and even singing voices. Many areas like these had been destroyed by the servants of Melkor when they had built the fortress, but this was left undiscovered because it was surrounded all over by hard granite with no openings big enough for anyone to go through. Except, of course, if the one that wanted to go through could make herself very small. And Tinwen wanted to go everywhere. Even when in love and in the shape of an adult, she was curious, stubborn, easily bored, and childish. Turon found it difficult to keep in pace with her. She would scare him by disappearing and jumping at him from the roof, looking like a valarauka. She would try to tame an abandoned baby troll. She would dance on lava and bathe in fire. And she would go and follow any interesting tunnel, stream, or, in this case, a small natural opening in a cavern wall. Turon had refused to follow her through and was now waiting for Tinwen to return. Suddenly there was a shout for help from the other side. In no time Turon was there, following the echoes through darkness. "Help! Water! I cannot get out!" Water turns out the fire of a fire-spirit. Turon suddenly realised he was used to having Tinwen's light around him. He hastened his steps and came to a pool of dark water. Something was splashing in the middle of it. He dived. There were only bubbles. He scanned the bottom of the pool. There were only rocks. Desperate, he came to the surface. And was greeted by merry laughter. "Look at you! Wet all over!" Tinwen was standing on a rock, shining, child-shaped, and very dry. Turon got angry. "You must never do that again! I thought I had lost you." "I am sorry. But look at what I have found for us!" And her light illuminated the entire cavern. Turon gasped. Together, they started exploring. The most beautiful chamber Tinwen named Coimirer, the Living Jewels. It was a garden of chrystal flowers, a forest of stony pillars, a cave almost as fair as those under the mountains of Aman, where Aulë delved. Walking here, she missed nothing at all. Except, sometimes, Alatáriel, to show her this place and walk there together. But maybe she would not understand, maybe her body of flesh would find the heat uncomfortable, maybe she would miss the stars and the wind and the living things, and her own kin. Maybe this place was a secret paradise meant only for two. New desires filled Tinwen's heart and flowed over. She stood there one such moment, waiting for Turon to come to her with the Morglin-stone he had borrowed for some reason. He asked her to become his wife, and she accepted. And he gave her a gift: the Morglin-stone set in a golden chain decorated with rainbow-coloured diamonds. "I have put an enchantment on the gold," he said, "it will not melt in the heat of your fire, my love." And he reached forth and set the chain on her neck and closed the lock. "Thus I take you mine". "Thus I take you mine." "It burns! Take the stone away!" Tinwen pulled the chained Morglin-Stone as far off her as it reached. This was not far enough. "How can anything burn you, my love? You are made of fire." "It is so cold, it was never this cold before! Please take it away now!" "I am sorry, my little one, but I cannot obey your request. The lock is impossible to open. You see, I mean to keep you for ever." With these words, Sauron captured her with one arm and fastened a length of chain into the treacherous necklace. Then he chained her to the wall of the chamber of Coimirer. "These chains are too strong for you to break, weak one, and no one will come here to break them for you, for I will seal the chamber and strenghten the walls with enchantments. Besides, you yourself have told me that none save Melkor knows where you went from Aman. And my Lord will be pleased to find you safely kept here when he returns." "If he returns," Tinwen managed to whisper. "And how does it help you if he does not? You shall see I can be cruel too. In fact, I think you shall see it very soon ... my bride ..."
Fire burns. Sometimes it burns you. Sometimes it burns down into ashes. No fire can burn for long in a sealed space. It requires air. Without air fire is not fire. But it is still there. Hot. Waiting. Melkor did return. He gathered his creatures and started fortifying Angamando, raising the Sangororimbë high over it. Sauron welcomed his Master and presented him two gifts. One was a small sword of Aulë's craft, which Melkor melted, using the iron to fasten the Jewels of Fëanor into his crown. The other was a prisoner. Tinwen heard the noises of change, but she could not fathom what they meant. Steps hurried to and fro. Tools crafted stone. Heavy things were carried from one place to another. Water splashed. Somewhere, fires rushed to flame. The earth itself was changing and moving, but none of the changes had reached the chamber of Coimirer, now dark and dusty, grave-like. Until the day Tinwen heard the seals being opened. Someone walked in, but brought no light. "You may call me your lord," said the visitor. Then he lifted a black covering from his face. Tinwen beheld the Silmarils, and for a fleeting moment her heart was aflame with hope and longing. Then she saw the face under the iron-crown. Arien was on one of her first journeys across the heavens. Suddenly she started crying. For no reason, she thought at first. Then some instinct told her that her smallest sister was being hurt beyond healing. A fire of gold had burned down into ashes and the cold ashes had been walked on by filthy feet. Tinwen did not cry. Her entire body was in pain, every limp was like crippled. She felt old and despaired. Her face was dark and lined, her hair hanged down in dirty ash-white tangles. She was not sure if she was alive at all. The maiar are untouched by time. Sometimes, though, they may be aged by worries, pains and sorrows. So was Tinwen, no longer fair, no longer glorious, no longer shining. She walked around her prison as far as the chains would let her. She whispered to the stones, recalling the light and beauty of Aman beyond the ocean. One day she found a stone that whispered back; a jewel-spirit. Slowly she tore it out of the wall with her bare hands. Then she polished it with the rags of her clothes. Quetondo she called it, the Speaking Stone. It taught her the language of rock, which is slow and few-worded, the tongue of pebbles, which consists of small rolling words, and the speech of stones, which is heavy and sharp and beautiful. And Quetondo told wonderful tales of mountains dancing, continents melting, valleys opening and hills rising. "I love the earthfires," said Tinwen, "tell me what word I must speak in order to call them?" Quetondo told her the word. She spoke it. The ground tore itself in two, smoke erupted from the crevice, and molten stone came after it. Tinwen was delighted to have light once again. Now she saw Quetondo, a tiny shadow dancing inside its crystal sphere. The fire could not melt Tinwen's chains, but it eased the pain caused by the icy Morglin-Stone. Melkor felt his throne shaking. He sent his servants to see what was the reason. They reported that the prison-chamber of Tinwen was opened and lava rushed out of it. He told Sauron: "You have been foolish to capture her so far underground. Find a new place to keep her." Tinwen was taken out by valaraukar, who flew her up to a sharp mountaintop of the Sangororimbë. There Sauron chained her. It was a cloudy night, a night of darkness. Sauron was in the shape of a vampire. He touched her face with a clawed hand. "You should see yourself now, little one. Nothing is left of your beauty and power." "That is not true and you know it. Powerless means useless, and Melkor still keeps me. He would not bother with useless captives. And as long as I could be used, I refuse it. I will not surrender!" "As if we would care about that. If you do not serve willingly, you will serve forced. Have you not learnt yet? Then I will teach you ..."
The next morning Anar rose in her glory over the mountaintops. Arien beheld a wretched little figure tied with chains into a peak. The figure lifted a hollow- eyed face. There was something familiar in its features. "Sister! Help me!" The voice was dry and breathless. "I cannot. I cannot come down. Oh, Tinwen!" And Arien the sun-maiden passed over the skies to the West with a message of pleading to carry. Some on the earth noted that the day felt unusually short, as if the Sun herself had been hurrying. The next day she came again, with the news that the Eagles of Sorontar would be on their way as soon as she woke them up. But Tinwen was no longer on the mountain. Melkor had seen her converse with Arien and had had her brought back below ground. This time her imprisonment was even more torturing: Tinwen was frozen inside a small glacier. She could not move, but remained conscious of the suffocating coldness all around her. Years passed, years of fear and war in Beleriand, years of terror and dark despair in Angband. But one hour there was that brought hope and eased the suffering of the captives of Angamando. For from the darkest and deepest hall where Melkor had his throne there drifted a song of beautiful dreams. All that heard it fell asleep, and Tinwen dreamed of Arda under Anar, of flowers rising and children dancing. Her heart found a familiarity in the enchantment; "Melian's daughter ..." she thought. Another dream there was, too; a vision of her own lost sword being broken and then breaking another sword, and of a Younger Child of Ilúvatar taking a Silmaril in his hand. Too soon the dreams drifted away and Tinwen was once again tortured and despaired; even more so now that she had been reminded of lost beauty. The one word was more than enough for Eönwë, who knew what Manwë had been waiting for. He left Taniquetil and was soon running towards the city of Tirion. Halfway up the hillside he suddenly wondered when was the last time he had run. Then the memory hit him like a storm. He had not run alone then, oh no ... Memories buried under the tides of time were floating up one after another. Healed wounds were bleeding once again. Eönwë had chosen to serve his master and stay beside him, but in his heart he often wished he had gone after the one who had abandoned him ... The herald realized he was standing foolishly in the middle of the road. He rushed to fulfil his important errand. Not so very long after this, in the scale of ages, Eönwë was leaning on his sword and watching the morning sun shine over a battlefield. The battlefield. The scene of his victory, and Eärendil's. He lifted up his sword to greet the man who was steering Vingilot back up towards the higher skies. There was blood on the blade, Morgoth's blood. From where he was standing, right opposite the broken gates of Angamando, he could see the place where the Dark Lord was kept chained and guarded. He could see the dead being buried and the wounded being treated. He could see the prisoners of darkness brought to freedom. They were weak and broken, they shielded their unaccustomed eyes from the light of the Sun and the Silmarils, all three of them. One was up the skies and the two others were kept under guard close to Eönwë. On an impulse he picked the jewels into his hands and lifted them high over his head. Then he saw her. Standing unbent, she had emerged from the dark caves and was now walking towards him. She was old and ugly, but Eönwë knew her at once. The rays of Anar reflected from her upturned eyes. Eönwë almost ran to her. When they met, they said no words. Instead, Tinwen put her hands into his. Only, Eönwë's hands held the Silmarils. When Tinwen touched the jewels, her fire was set alight. She was now tall and young and beautiful, clothed in white flames, her hair a black cloud like a memory of gone sorrows. Eönwë kissed her. An eternity after this, in the scale of love, as they stood by themselves some way from the blood-stained battleground, Tinwen asked: "Am I free now? Where is Sauron?" "I do not ...," Eönwë began, but he was interrupted. As he was. He looked handsome and kind once again. He knelt down at Eönwë's feet, begging for mercy. "I have not the power to pardon those of my own rank. Therefore, I command you to return to Aman to be judged by Manwë." Sauron walked away with his head bowed. "You let him go unchained like that? You speak of pardon?" Tinwen was furious. "You still do not understand what he did to me." Tinwen showed Eönwë the Morglin-Stone. "As long as Sauron is free, I am enslaved. See, here is a chain you could not break. As long as this binds me, I cannot come to Aman with you." "Then will you marry me here? As for Alatáriel, she has been married for centuries." Eönwë managed a smile. "No. You will set me free to marry you in Aman. You shall prove your love to me by destroying Sauron's power." "Why bind us with more oaths? I fear this is the last chance we are given. I can only do what is in my power and what my Lord allows." "I was tortured while you enjoyed yourself in Aman." "Enjoyed myself? Hardly, when my heart had been torn away." "Then why did you not come? I was bound and chained, frozen and violated, and you did not save me!" "It was you who left me! I hoped you would return. But you had forsaken me for the sake of one that you loved more than me! You think your filthy secrets are unknown to me. But Morgoth flaunted them all at me when he saw I would not be merciful on him anyway." "And you believed him?" Tinwen was trembling. "Of course not. Ten warriors were needed to keep me from cutting him to pieces, Manwë be merciful! But now I read the truth in your eyes. You believed him. You left me. You wanted Sauron, you desired him! You smiled at him when he gave you that slave-chain!" Tears rolled down Tinwen's cheeks, tears of all the ages of her imprisonment. When captured, she had held her pride. Now nothing kept her from crying out her pain and loneliness. Her legs failed her, and she fell sitting on the ground. Then she felt Eönwë's strong arms around her. "I love you, Híniel! Oh, how I missed you! And I want you, no matter what." He kissed her again and again. "I am sorry. I wish we were back in Almaren and I could dance for you and throw this black stone away and the two lamps would shine and never be broken and we would be there forever. For I love you, I do!" "Me and no other, this time?" Eönwë's voice was serious but his eyes smiled teasingly. "Many others, actually." Tinwen laughed through her tears. "Tell me right now!" He pretended to threaten her. "Well, my lady Vana for one, and all the Valar, and Ilúvatar the father of all." "But no others, I'm sure." "Of course! Arien and all my other sisters, but Arien the most because she would burn me if I said something else." Tinwen pointed at the Sun. "Two more. Here is one." And she took a crystal sphere from her pocket. "So this is your dearest one, Tinwen," said the jewel-spirit, "shall I tell him all you said about him?" "Aha! And the last one?" Eönwë tried not to laugh at the tiny spirit before Tinwen had put it back down her pocket. "Do not be stupid. Alatáriel, who else! Do you know where she is?" "She is living as a refugee at the mouth of a river named Sirion. She and her Moriquend-husband have been through much joy and sorrow, blessing and pain." "Then I must go to her at once! I will come back as soon as I can." And she kissed him and went away, not looking back. The watchmen took their duty very seriously. They were all that stood between the Eldar of the Mouth of Sirion and the rest of Beleriand, and the rest of Beleriand was a dangerous place. Especially now, when thunder stormed from the north and the earth shook and the river Sirion ran almost dry and no one knew what to do when sea was swallowing land. So the two Sindarin Elves stopped the stranger woman that they saw running under the trees, because they had never seen her before and were not sure even whether she was Elf or human, what with her being so wet and clad in ragged white clothes and her hair a mess of tangles. No decent people, they thought, except watchmen, should be out in a weather like this. They asked her who she was and what was her business there. "Who I am is no business of yours. I have come to meet the Lady Alatáriel." She spoke the High-Elven language in a way that suggested it was very familiar to her. "You mean Lady Galadriel?" They had never heard her original name. "I might, and then again I might not. Tell the Lady Galadriel that El-Carnil has come to meet Lauremiriel." "El-Carnil? Some say Carnil's a star that means bad news when it shines bright." The younger of the watchmen looked worried. "I am not shining very brightly at the moment, am I, gentlemen, nor is my namesake up in the heavens behind all those dark clouds that are dropping their water on me all the time I have to explain things to you thickheads!" The watchmen had never heard Quenya spoken in such a tone and the one who had shown an interest in reading fate from stars hurried away to find Lady Galadriel. The other watchman led El-Carnil under a thick-leaved tree that kept the rain away. He felt this woman probably deserved more respect than what she had received so far, so he offered her his cloak to sit on and welcomed her politely to their country. "You mean, if anyone is ever letting me cross the borders," was the rather bitter response he got. For a while they sat in silence. The watchman tried to start a conversation. "Any news of what's going on in the north ?" The woman stared up into the rain. "Great messages are brought by great messengers. Have you not seen Eärendil? He was worthy of his message, a star brighter than others. El-Carnil is not bright, so fear not." They waited in silence. Galadriel did not send a message; she came herself, her clothes wet and her hair dripping. The two women embraced, and started walking hand in hand towards Galadriel's house. The younger watchman stared after them, standing in the rain. "What's the matter with you?" his companion inquired. "You know, she's actually sort of beautiful." "Ha! Want to know what she said about you when you'd gone?" "So what will you do?" Galadriel asked after having heard the whole story. "I do not have much choice. I cannot marry him, you know." "Why not? You love him." "I am under a curse. I cannot bring it over him. I am like diseased, my soul is stained." "And yet you touched the Silmarils and your hands did not burn." Tinwen found no answer. The great news came the following day, and soon came Eönwë with his army, but without the Silmarils. The jewels had found their fate. Many left the changed face of Middle-earth that time, both Elves and Men. And finally Eönwë left also, on the command of Manwë. When the last glimpse of his sails disappeared beyond the horizon, Tinwen turned her back to the sea and ran away. She ran forward for days without stopping, she ran to the other side of Ered Lindon until she found a wilderness where no-one dwelt. Then she fell on the ground and cried. For years she wandered in the forests of Eriador, hunting and eating wild berries, wearing animal skins, avoiding all peoples. She built herself no dwelling-place. Instead, she slept in trees and under trees, and in earth-holes. Sometimes she moved swiftly from place to place, as if pursued by invisible enemies. One day Tinwen hid in the branches of a great oak while a company of Elves rode underneath. They were obviously returning from a hunting trip. Their saddles were full of prey. They laughed and sang gleefully. One of them struck Tinwen's eye. He was handsome and had the air of nobility about him. "That one," Tinwen thought, "would not leave his loved one in torture." Silently she followed the hunters into a beautiful city. Later on, she found the Elf-lord she had watched sleeping under an apple-tree in a beautiful garden. 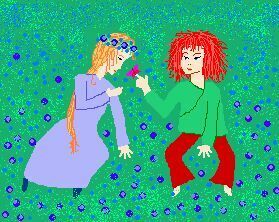 She took the shape of a fair Elf-maiden dressed in violet, pale-faced, her hair night-black and meticulously arranged. She began a song. The Elf-lord awoke and gasped in amazement. That instant his doom was engraved upon his soul. "Who are you, fair lady?" "My name is Tinwen Hiníel Cal-Urúnya Maialaurë El-Carnil." "That is too long a name for my humble use. Can I call you Elai? I am Ereinion." "The moment I saw you, I loved you, Ereinion. You may call me whatever you like." "So did I love you the moment I saw you, Elai." They conversed all day and all night under the apple-tree. Elai told Ereinion everything that had befallen her since the making of Arda. Ereinion told little of himself. Instead, he recalled the story of Thingol and Melian. "Melian was a Maia," he concluded, "as are you, but Thingol was king in the land of the Moriquendi, although he himself was of the Calaquendi. I, on the other hand, have been born in this land of exile, and thus of the Moriquendi, but I am also king of the Noldor, who are Calaquendi." "You are king?" Elai was not very surprised. "Ereinion Gil-Galad, High King of the Noldor, at your service." He knelt. "Will you marry me, my fair Elai?" "I have told you the reason I cannot." "Then I swear I will destroy Sauron when the time comes, or die in the attempt." He put his hand on his heart and the other on his sword-hilt. "Oh, Ereinion, I hope the time does not come too soon. I fear I shall lose you!" "Either you lose me, or you get me." The time did not come soon. Tinwen was presented to the court as Lady Elai. She remained close to Gil-Galad where ever he went. They spent centuries together, waiting for a dawn of blessed future. Instead there rose a dawn of blood. Númenor fell, but the Faithful came to Middle-earth, and Elendil came to Gil-Galad. All too soon, in Elai's tearful eyes, it was time for the Last Alliance. Elai travelled with Ereinion to Imladris, where all gathered that opposed Sauron. There, in the last evening, many songs were sung in the halls of Elrond. And a song, rarely sung, was then sung of the destruction of Angband. Eönwë was praised. Ereinion saw tears brimming in Elai's eyes. He walked her out into a lonely terrace under the stars. "You loved him." It was a statement, not an accusation. "Yes, but he loved me not. Now I cry for a love that is dead." "I will love you till death and beyond! Our love shall not die! Do you trust me in this, my fair Elai?" "Oh, Ereinion!" Her kiss was full of passionate fire. It almost burned his mouth, like a boiling drink. Yet the aftertaste was sweet, as always. "You should not go. I fear for your life." "This is my fate, beloved one. I am a warrior. And I have sworn an oath to you. For your sake I must face death, for your freedom I must battle Sauron the Cruel, even with my bare hands should my spear fail me." "But what shall I do with all the freedom in the world, if I cannot share it with you, my noble one?" "Ah, Elai!" Ereinion fell to his knees. "I see I have to explain myself. In your captivation I also am captured. For I desire you, my sweet one! I long for our marriage. I go forth for your sake, but also for my own sake. I could not wait forever." Suddenly he pointed at the moon. "Look, there goes Tilion the hunter, ever in pursuit of your sister Arien. Every time he reaches her she burns him with her fire. Poor Tilion! Will you let me be like him till the end of my days?" "Not if I could help it." Elai took his hands and gestured him to stand up. "As I am now, I am filthy. A man that would take me as a wife is taken, would soil himself in the poisons of Morgoth." "You are impure, as you say, and yet you can live and smile and touch me. Were I to share your burden, could I not do the same?" "What you suggest! I believe you could not, since I am of stronger make than you, and my strength has been increased by the fire of the Silmarils. Had I not touched them, I would not be able to smile. You, I believe, would die a painful death." "And yet, yet I desire to take you, tonight! What is death and pain to one who has joined with eternal fire and emptied a cup brimmed with light! Cursed my honour that binds me! Cursed, cursed be Sauron that binds you!" As he spoke, he first embraced her tightly, talking almost into her mouth, then turned away, and buried his face in his hands. "The cup, I fear, is brimmed with darkness, and the fire breathes evil fumes. Go to Mordor, as you must, my love ... but I shall not wish you farewell ... I shall ride beside you! Eönwë taught me how to use a sword. I have slain orcs, goblins, and a balrog, too." Elai grinned wildly. The rest of the night Ereinion Gil-Galad attended a feat more difficult than turning a mountain upside down; turning Tinwen's head. Unsuccessfully, of course. The battlefield smelt of blood. A lonely figure stood on a hill, contemplating. It took no part in the celebration of the victorious armies. Raven-haired, bloodstained, Tinwen the warrior grieved for her lost love. "Lady Vana," she prayed, "relieve me! I cannot bear this new burden. He died for me, he whom I loved more than life itself! Take my life, o lady! I cannot live any longer!" But she lived, and walked away, and went with those that had come from Laurelindorenan, for she sought to share her grief with her beloved friend, Alatáriel. "I believe your story is not written yet," said Alatáriel, "Indeed I believe you shall yet be comforted and comfort another." "All the world is a burden to me, and my life has no joy because my love is dead!" "Then mourn! Mourn with all your heart! Sing the lament of Gil-Galad, and it shall be the most beautiful song ever sung of him! And the sorrow will pass, and you will see the clouds opening once again." Time and the magic of Lothlórien healed indeed Tinwen's wounded heart. She gathered new strength. But her appearance had changed once again; now her hair was silver and she looked, if not old, mortal. One day Tinwen just felt like having had enough time of sorrow and comfort. Now it was time to open a new page in the book of her life, to find a new place and yet another name for herself. So, on a spring morning, having bid everyone farewell, she walked away from Lórien, not looking back. The road took Tinwen to Osgiliath, where she served three kings as an educator of the royal children, known only by the name of Nanny Wen. But no mortal man was anything like Lord Eönwë or king Ereinion, fair though they were, sea-eyed, and though many courted her earnestly. A mere servant she was, but the dream of many a nobleman of the Númenorean race. Their advances became so disturbing that she had to leave the entire country. Tinwen decided now to do something she ought to have done aeons ago: to get to know the people of Aulë, the Dwarves. She took the form of a grey-haired Dwarf-woman and made her way to Khazad-d�m. There she studied the craft of the mastersmiths and even tried to remove the black necklace that burdened her. Whatever the Dwarves called her is not known. She remained under the mountains until the very end, and when the balrog came, she challenged it, but lost hopelessly and barely managed to survive. She then went to Imladris, although the memories that a certain balcony there brought her were hard to face. Imladris became her home for almost a millennium. There she could be alone and think, visiting Lothlórien whenever she pleased. Of kings she thought, and kingdoms, darkness she contemplated, and light everlasting. More and more her thoughts turned westward with longing. She thought, maybe she ought to go to the Havens, to be close to the sea, even though she was still bound to Middle-earth. Tinwen was well on her way to the Grey Havens when she entered a strange land. A land of peace and plenty it was, and known by the name of Shire. And the people that dwelt there were strange indeed; Hobbits they called themselves, small and hair-footed. Tinwen disguised herself as one of them, a grey-haired outlander. She marvelled at the homeliness of their underhill houses, their savoury cookings, and the quality of their beer. Indeed, she ended up spending decades in the Shire instead of just passing by, so well she liked the Hobbit lifestyle of pleasure and childish curiosity. The name she chose to call herself was Tinwen Hawkfeather. The Brandybucks liked her, the Tooks adored her, and others endured her. In their opinion it was wise of her that she did not flaunt her outlandish experiences at their faces like most travellers, but remained content sitting quietly at one tavern-corner or another, and it was only after persistent urging that she would tell stories of Elves and foreign lands. One sunny day she met another traveller at the Green Dragon Inn, and this one knew her beneath her new looks. "Well met, Tinwen Hiníel!" he said. "The tides of the world are changing, and a new wind rises from the Shire! Strange that I should meet you here. What is your business in this land?" "Of the tides and winds I know nothing, I am here doing nothing in particular, and even if I had any business it would not be your business!" "I'm sorry," he said, and to show that he was he bought her a beer. Before she knew Tinwen was chattering away all she knew of the current rumours, especially those concerning a certain Bilbo Baggins. "He's a honest old fellow, no doubt about it. And a good listener, you know. He appreciates poetry, really. Too bad I cannot tell him it was I that wrote 'the lament of Gil-Galad'. But children he doesn't understand, not one bit. You see, he has this little orphan Frodo that he's spoiling horribly. I've got my little house in Hobbiton and an apple orchard and this boy Frodo, he's always stealing my apples, although the Bagginses have apple-trees of their own. But, mind you, he's a sweet kid in his own way, always greets me so politely. Not like some kids that call me 'old bat' when they think I'm not listening." When Olórin departed, he warned Tinwen that evil times were coming and she'd better take shelter somewhere safe. She replied she was going to go to Lothlórien after having visited Cirdan. So she did. And the evil times came, times that are fully described elsewhere, and finally the war swept Lorien too, and once more Tinwen Hiníel went to battle, and once more the enemy was slain. And then came the day that the chains on Tinwen's neck crumbled to dust, and the Morglin-stone shattered to pieces, and she knew her enemy was destroyed. Sauron was dead! Not long after, having learned who and what overcame the Enemy, Tinwen made her journey westwards. As a spirit little more than a wisp of smoke she crossed the ocean, and then she stopped on Tol Eresseä. Eönwë was delighted to find her again. "Hiníel, my darling one! How I have missed you!" "Then why did you leave me?" "Because Manwë commanded me to." "Then why did you not return?" "I had work to do here." "I do not believe you had work every moment. I think you were afraid." "Do you forgive me that much?" "I am sorry. I cannot forget my years in Middle-earth. I cannot love you any longer." Niphredil looked out the round window. Behind her, Mother was cooking. Mother's brown hair shone in the firelight. Outside, it was raining. Niphredil was happy about that; today would be a storytelling day. She was standing on a chair in front of the window. The rain covered the sea from view, but she knew it was there, beyond the garden and the small forest. And Father would be there, too, watching the waves and getting wet. "Niphredil, would you wash the vegetables?" Mother called her. She went obediently. "Mother, how did you fall in love with Father?" She asked as she bent working. "It was sunset. I stood on the seashore watching Arien descending in her glory. Suddenly he stood there behind me. I did not know who he was, but I saw he was burdened by some ethereal sorrow. My heart went out to him then, and I wished I could help him. But in his eyes I saw my own sadness mirrored. I started crying then, and he tried to comfort me." "'Fair lady, do not cry', he said." "'Am I fair in your eyes?' I asked." "'Yes you are, old and wise and fair', he replied gravely." "'All I feel is old.'" "'But I see wisdom in you, and beauty beyond measure.'" "'My lord, your compliments feel overwhelming.'" "'In my eyes, you are. I see you cloaked in power.'" "Then we just looked at each other's eyes and understood each other wordlessly. We two were meant to be one. This moment had been waiting for us all our lives. This was our night. He took my hand in his and led me to a forest clearing. There, we watched the stars come out until I fell asleep in his arms. And when I woke up in the morning, my hair was as brown as his." Father came in soon after the story was finished. "I have something for you, Niphredil!" he said. He held a large seashell in his four-fingered hand.